Six Samford University alumni, representing a wide range of achievement in law, education, ministry, missions, philanthropy and community service, will be honored during 2017 homecoming festivities with the university’s annual alumni awards. Alumni of the Year honorees were nominated by members of the Samford community, and selected by a committee of Samford Alumni Association representatives and university administrators. They are distinguished in their professional careers, community and church involvement, and in their ongoing service to Samford. 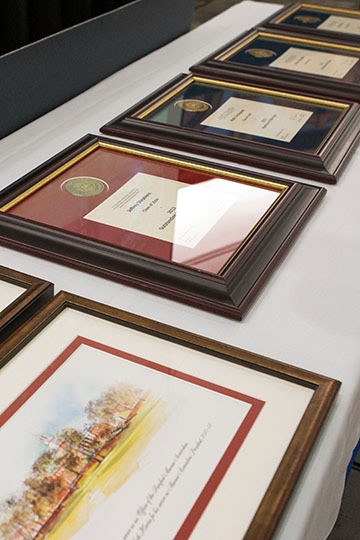 The awards were first presented in 1956, and 120 alumni have been honored since. The award to an outstanding young alumnus honors a graduate from the past 10 years, and 10 individuals have been recognized. The Humanitarian of the Year award was established in 2016 to recognize Samford graduates of distinction, wide respect and acknowledged leadership who have made outstanding contributions to better the lives of those around them by staying true to the Samford mission. Joel Brooks ’99 and Stephen Dillard ’92 have been named Alumni of the Year, the highest honor the university bestows on graduates. Lauren Lunceford is the Outstanding Young Alumna, an award that was established in 2009 to recognize recent graduates for professional achievement and involvement with Samford. Lunceford received a Bachelor of Science in 2009 and earned a master’s degree in gifted education in 2011. She continues to be involved with Orlean Beeson School of Education in several volunteer roles. Lunceford is a teacher at Cahaba Heights Elementary School in Vestavia Hills, Alabama. She taught for several years at Mountain Brook’s Cherokee Bend Elementary School, where she was named Teacher of the Year for 2016–17. Three individuals, including a husband and wife team, are being recognized with the Humanitarian of the Year award. The Ackers’ commitment to ministry and missions began when they met on a university-sponsored mission trip. Jade received a Bachelor of Science in history and mathematics in 1993, and Shelah earned a Bachelor of Arts in religion in 1996. The Ackers will be in Uganda during homecoming, so they were presented their awards at a special ceremony July 31 on campus. Amy Jo Young Osborn of Birmingham is cofounder and president of the Austin Hatcher Foundation for Pediatric Cancer, named for her infant son who lived only nine weeks due to an extremely rare and aggressive form of pediatric cancer. She and her husband started the foundation in 2006, and it has assisted more than 70,000 children in 28 states and 38 hospitals. Osborn received a Bachelor of Arts in journalism in 2002 and worked as a photojournalist for Southern Progress Corp. The honorees will be recognized at the homecoming banquet Friday, Nov. 10, and at other events throughout the weekend.